The Scoop on Good Grammar by Margie Blumberg is not only informative and easy to use, but is also fun to use. The book begins with the basic parts of a sentence and the eight parts of speech. It then progresses through those problem areas of making words plural and showing possession. It tackles the tough subjects of relative, demonstrative, indefinite, interrogative, intensive, and reflexive pronouns, before taking a dive into adjectives. The action heats up as the verbs rush into the picture, sporting various twists and turns. Capitalization and punctuation bring up the tail end, showing how important they are to the meaning of a sentence. Finally, a plethora of special words and phrases, that have a tendency to trip up even the most athletic readers, writers, and speakers, join the chase toward the finish. The answers to the quizzes which were included throughout the book allow the reader to discover how well they have advanced through the grammar lessons. Exploration, art, food, sports, movies, poetry, and travel are used as themes to help draw the reader’s interest to a sometimes dull subject. Margie Blumberg has designed a method of teaching grammar that is presented in an interesting and lighthearted manner that lessens the struggle. Her approach makes this sometimes dry subject more like eating cookies at “grammer’s” house than trying to choke down “grammar” from a text book. The graphics and photography add a great deal to making the subject matter easier to swallow. The book is not only easy to read and use, but it is also easy to reference for someone who needs a quick answer to a grammatical challenge. English teachers who are looking for a new approach to teaching grammar will fall in love with this book. Students, writers, and those experiencing the English language for the first time should refer to this guide first, because it is easy to use and addresses some of the more difficult challenges in a concise and accurate manner. This book should be on the shelf of every person who writes or speaks the English language. 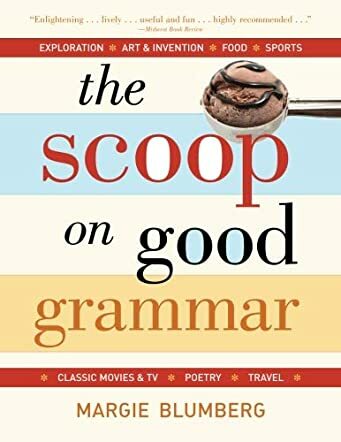 The Scoop on Good Grammar by Margie Blumberg is a book on grammar that teaches the nuances of the English language and how to use words and verbs correctly. The book gives you grammatical lessons which make your language more fluent and correct; and it clears many of your doubts about the language and how to use words effectively and with ease. Punctuation is another aspect which is very confusing for many of us. This book teaches you how to use punctuation properly and construct good sentences. I love this book. Any number of books that you read on English grammar is not really enough because many times you are dogged with silly doubts. This book deals with basic grammar, formation of grammar, subject-verb agreement, punctuation, and singular/plural which will help one create a good foundation for the language. The author's explanations are so clear and can be understood well. The quizzes prepared by the author are helpful to make you judge how much you have understood the chapters. Abbreviations, numbers, letters; the author has explained them all. The book is very colorful and the contents and layout are appealing to the reader. Every school library, parent, and teacher should own this book because it makes English grammar teaching so easy and effective. You will see a remarkable change in the way you use the language once you go through the book. It can also be used for reference at a later stage to clear your doubts. The Scoop on Good Grammar by Margie Blumberg is an easy-to-follow grammar manual. Each section contains a non-grammatical topic that serves as a focus for examples of the grammatical subject covered. The Scoop on Good Grammar covers parts of speech, tenses, case and punctuation, and has self-checking quizzes at the end of each section. This guide is geared towards just about anyone with an interest in language -- from the ESL learner to high school and college students to freelance writers. Common errors and misconceptions are explained with examples showing the correct and incorrect usages. Blumberg also differentiates between what is acceptable and preferable where appropriate. If you get confused between "lie" and "lay" and "bring" and "take", you'll feel a lot better after working through her sections on these verbs. I have always been interested in grammar and how language works, and have read many books on the subject. I was intrigued when I read a description of The Scoop on Good Grammar by Margie Blumberg. This is one of the most accessible grammar books I have come across. It's really quite entertaining; however, some of the introductory topics may make you hungry. While ingesting verb forms, pronouns, and punctuation, you'll learn about the history of cupcakes and bagels, and what the workers in a pizzeria are called. You'll also learn fascinating details on sculptures, cities, and man's first steps on the moon. Blumberg takes what can be a complex, dry, and exacting subject and makes it fun and understandable. I like The Scoop on Good Grammar and know exactly where to go whenever I need grammatical information. Even those who shudder at the thought of grammar books should be pleasantly surprised and enlightened by The Scoop on Good Grammar. Do not pick up The Scoop on Good Grammar by Margie Blumberg thinking it is just another boring book on the rules of the English language. While it is a comprehensive guide to English grammar, it is in no way boring. Ms. Blumberg presents the parts of speech and the rules that govern them in a way that allows you to read them as if you were reading a story. Each chapter begins with a paragraph or two about a topic that is not related to the subject the author is teaching, but it gets your attention as she explains how the different parts of speech are used. For instance, she uses a paragraph about ice skating to introduce you to verbs, explaining that the action in the paragraph is described using verbs. Later in the book, the author uses movies to explain the concept of capitalizing titles. I thoroughly enjoyed reading this book. I felt that Margie Blumberg put great effort into simplifying the rules of grammar so that almost anyone at any level can understand them. She uses fonts in varying colors and sizes to emphasize her points, and she supplies more excellent examples of the rules than any other book of this kind. I would highly recommend this book to anyone who has the desire to communicate correctly via the written word. The author who needs to brush up on the rules will find it easy to navigate, and the student will find it complete.